Clever Gillian at Some Say Cocoa made mendiants, French chocolate disks studded with dried fruit and nuts. They inspired me to try a block version using the leftover bits and pieces from our Christmas cakes. 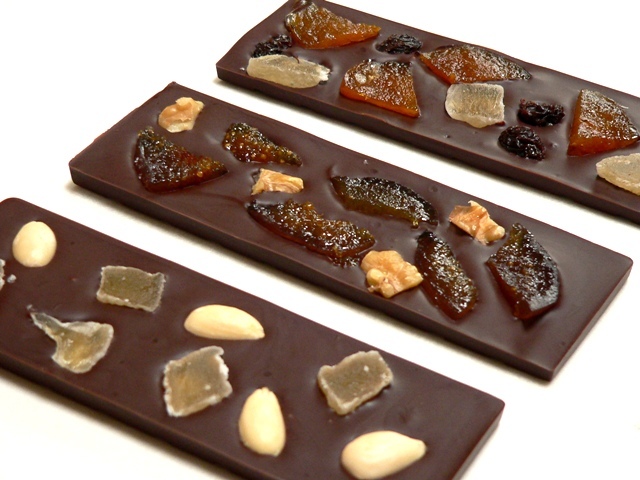 Above, from left to right, are almond and crystallised ginger, glacé fig and walnut, and glacé apricot, ginger and raisin bars. They’re quite easy to make – pour the tempered chocolate into block moulds, then embellish to your heart’s content. As Gillian points out, you need to work quickly, as the chocolate starts to set up straight away. 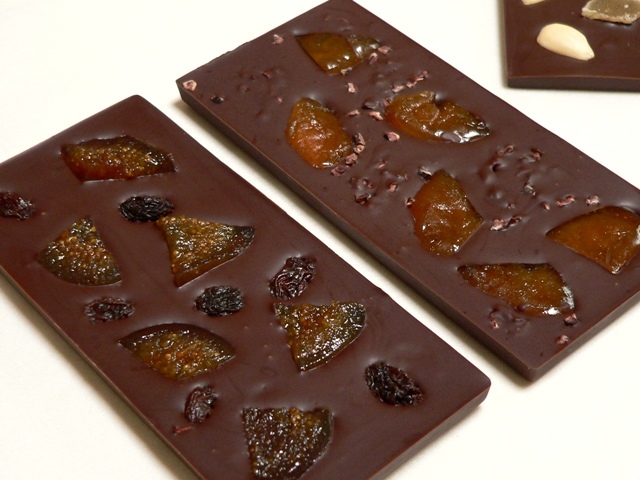 I also made a couple of larger blocks – one with glacé fig and raisins, and the other with glacé apricot and cacao nibs. Wrapped in cellophane, these bejeweled bars will make a festive addition to our Christmas hampers! Thank you to everyone who entered our Giveaway! Maryann, Sue and Liz, your parcels will be in the mail shortly! They look good enough to put on the mantelpiece or to be desired in very expensive chocolate shop. Mmmm! I’ve asked for a chocolate melting pot thingy for christmas so might join you in chocolate tempering next year! it might be a waste of money, what do you think? Jo, it will only temper the chocolate if it takes it to its tempering point (88 – 90F for dark) and keeps it there. I’m not sure that machine will do it – it looks a bit more like the ones they sell for melting chocolate for fondues etc. – and they don’t mention tempering at all in the product description. Might be worth sending them an email to confirm? They look great. I really need to get the hang of tempering. Hi Celia, I just received my package and can’t wait to bake! Those gloves are awesome. Thanks again. :( only 70 degrees. I rang them up and asked. Good thought! That’s no good then. I will have to think again or use a thermometer like you! I suppose it could still be nice for chocolate fondue? I bow to the Queen of presentation – they look very professional. Did you use your chocolate bar moulds … not sure what block moulds are? I’m using my chocolate bar molds (thats for the Candyland tip!) … last night white chocolate and crushed roasted coffee beans. The colors looked so pretty together. I have been thinking of making these – saw the receipes http://www.seriouseats.com/recipes/2008/12/red-and-green-recipe-white-chocolate-bark-wit.html but yours look perfect!